While Emerald is known to be one of the most popular stones, rings are known to be the most desired and loved piece of jewellery. The amalgamation of both - an Emerald ring forms the most prized possession of a lady. TJC’s overall collection of gemstone jewellery is rich in emerald specially designed and handcrafted by exceptionally talented and skilled artisans for UK customers. With a wide price range to suit your pocket, TJC flaunts over hundred rings to complement your persona and cater to your diverse needs. Emerald is the birthstone for the month of May marking the transition from spring to summer with its vivid green hues. Emerald is known to accentuate the beauty of the bearer when set in gold, silver or platinum and these Emerald rings have been forming an integral part of a woman’s collection for hundreds of years. This enchanting gemstone has recently emerged to be the second most loved stone after Diamond with today’s brides-to-be increasingly opting for these. We at TJC offer a plethora of designs to choose from; there are engagement rings, eternity rings, and wedding rings to suit your unique style and requirement. We also house some of the best pieces of stones, mined from their best locations. Our designs of Colombian emerald rings have especially garnered the attention of over hundreds of jewellery connoisseurs. The forest-chromed enigma of emerald looks rich and fantastic when it is paired with the traditional radiance of yellow gold. Both the hues beautifully complement each other and offer you graceful luxury in the best of fashions. Be it elite AAA emerald ring or other luxurious grades of the gem, our designs exude boastful luxury for you. Explore the diverse and stunning range that offers you different tones of gold, from the traditional charm of yellow gold, to the pristine glamour of white gold and darling softness of pink gold. Exuding luxury from every cut and design, TJC’s Emerald and Diamond rings online are a perfect accessory for all occasions, be it an intimate evening with the beloved or a significant prospective client meeting in the afternoon. Deserving a special place in your jewellery collection, these rings are mesmerising and are an epitome of elegance, garnering not only the attention but also the envy of the onlookers. TJC brings an exquisite array of pristine rings to choose from and mark that special moment of your life. Celebrate these special days every year with an immaculate design as not only a gift but also a reassurance of your love. Reflecting majestic and regal glory from all facets and angles, our features of green emerald rings in silver bring you designs that you won’t find anywhere else. Fit for all occasions and events, these exquisite treats house posh glamour at pocket-friendly prices. You may find designs with the base of sterling silver and plating of premium metals like gold, platinum, rhodium, and such more. 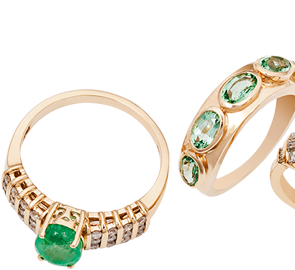 In the dazzling company of other gems or just with emeralds, these rings will steal a spot in your hearts. Here at TJC, we believe in mining our gemstones. This offers you an elite and premium grade of the crystal that you won’t find anywhere else. Our divinely designed real emerald rings bring you the best possible grade of the stone. The above said, we also understand your budget. We love working within it, too! Our range of affordable emerald rings brings you a fantastic assortment of the gem, all at prices that your pockets are going to love. Come and seek uncompromised luxury at lovable prices, only with us!